Today it will be relatively dry and sunny for most of the UK but the clear skies will see a drop in temperatures for the night as the weekend approached. 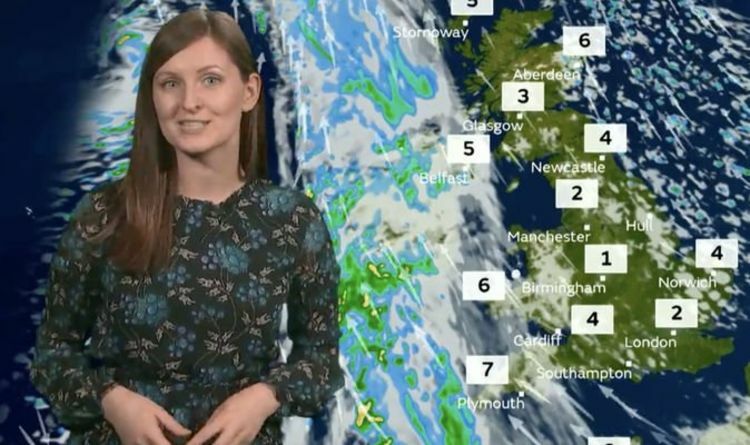 The Met office’s Becky Mitchell said: “It is a bright and cold start for much of the country today but in the west it is a little bit cloudier. “We have some rain, particularly in Northern Ireland with a grey start here with outbreaks of rain and drizzle. “Across Scotland it is brighter but we do have some showers just clipping into north sea coasts. “For much of England a very sunny start indeed, Wales with perhaps a little bit more cloud but it should clear over the next few hours. “For much of the day it does stay dry bright and sunny, a very crisp winters day on the cards for much of the country. “Some showers still clipping into north sea coasts but for most of us it should stay dry. “Temperatures around 4 to 6 degrees but when you add on the strength of the wind it could feel closer to freezing. “Overnight most of us should see a dry journey home but with a clear skies temperatures are going to fall away quite quickly. There has been high pressure to the east and low pressure to the west but the high pressure has been keeping weather fronts at bay. It is the high pressure that is expected to dominate on Thursday and Friday and brings the UK colder temperatures. The Meteorologist closed by saying: “ It is all set to change for Saturday though with wetter and windy weather will be brought in by an area of low pressure moving in.